Home / Thyroid Journey / What Does theThyroid Gland Do? These Thyroid Journey posts are about my personal experiences, things I have learned, notes of interest and info. that might be of help, on the winding road of managing thyroid health and issues. What is the thyroid responsible for in the human body? Good question, until I got sick it never really mattered to me all that much. Now though, it's a different story; I need to know all the basics before I can move forward. Let's travel down the information highway together and learn about this butterfly shaped gland. The thyroid is a vitally important hormonal gland that plays a major role in the metabolism, growth and maturation of the human body. It helps to regulate many body functions by constantly releasing a steady amount of hormones into the bloodstream. More hormones are produced when the body needs more energy, like when it is growing or cold, or during pregnancy. The thyroid gland produces hormones which regulate the body’s metabolic rate as well as heart and digestive function, muscle control, brain development and bone maintenance. Its correct functioning depends on having a good supply of iodine from the diet. The release of thyroid hormones from the thyroid gland is controlled by thyrotrophin-releasing hormone (TRH) from the hypothalamus in the brain and by thyroid stimulating hormone (TSH) produced by the pituitary gland. This forms part of a feedback loop called the hypothalamic-pituitary-thyroid axis. 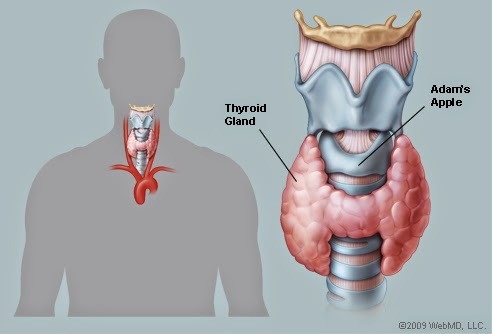 The function of the thyroid gland is to take iodine, found in many foods, and convert it into thyroid hormones: thyroxine (T4) and triiodothyronine (T3).Thyroid cells are the only cells in the body which can absorb iodine. These cells combine iodine and the amino acid tyrosine to make T3 and T4. T3 and T4 are then released into the blood stream and are transported throughout the body where they control metabolism (conversion of oxygen and calories to energy). This makes iodine an important substance for thyroid metabolism. It is a trace element, which means that the body cannot produce it itself, but needs to take it in with food. In the intestine, iodine is taken from the food and enters the blood stream. After a few intermediary steps it is built into the thyroid hormones in the thyroid gland. What are these T3 & T4 hormones my thyroid gland produces? Since the thyroid hormones are vitally important, there is usually always a sufficient amount of T3 and T4 in the body. Some of the hormones are stored in the thyroid as droplets; others are tied to carrier proteins in the blood. When the body needs more hormones, T3 and T4 can be released from the proteins in the blood and take their effect. Moreover, the follicles in the thyroid tissue can supply more hormones. The thyroid gland is under the control of the pituitary gland, a small gland the size of a peanut at the base of the brain (shown here in orange). When the level of thyroid hormones (T3 & T4) drops too low, the pituitary gland produces Thyroid Stimulating Hormone (TSH) which stimulates the thyroid gland to produce more hormones. Under the influence of TSH, the thyroid will manufacture and secrete T3 and T4 thereby raising their blood levels. 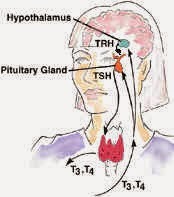 +The pituitary senses this and responds by decreasing its TSH production. One can imagine the thyroid gland as a furnace and the pituitary gland as the thermostat.